Randall "Randy" Atcher was the fifth child in a family of eight siblings, born in Tip top, Kentucky. When he was just eight months old, his family moved to the Red River valley of North Dakota. The family was a musical one. In fact, you might know one of his brothers, Bob Atcher, who was a long-time star on the WLS National Barn Dance in Chicago. He attended grade and high school at West Point, Kentucky and graduated salutatorian of his class. But when Randy was 12 years old, the family moved back to Kentucky, but his professional began to take shape. He sang and played both the guitar and mandolin at radio station WHAS in Louisville, Kentucky when he was on vacation from school and on Saturdays, too up to his graduation from high school. He enrolled in Western Kentucky State college to continue his education, but a catastrophic flood in 1937 caused those plans to change for him and many others as they struggled to rebuild their family homes and recover from the floods. During that time, he continued to perform on WHAS, until one day the time came when things were back to seemingly normal at home. Randy left Louisville, looking for the future. In 1938, he formed his first band in Chicago and soon found his talents were noticed by another music-world professional, Ben Bernie and he appeared with him on radio stations WJJD and WBBM, singing before the larger listening audiences that Chicago offered and was soon gaining a loyal following of fans. A WHAS write-up on the Randy Atcher show mentions that Randy was with the Ben Bernie Show on the CBS Network in 1941. World War II interrupted his career as it did for many artists and worked his way up to the rank of Air Force major during his three and a half years service. When he returned from the service, he had another surprise for his friends and family, his new wife Daphne, a native of Australia, who he had met and fallen love with. He restarted his musical career when he came back, working on the radio stations. It was at this time that his career saw him earn a recording contract with the MGM record label and also become a star of the WHAS Old Kentucky Barn Dance radio show. It seems coming back to his home state a third time proved to be the lucky charm. He returned to WHAS radio and the new WHAS-TV in March of 1950. 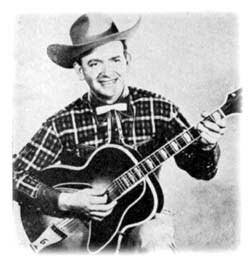 He formed the Red River Ramblers in 1951. 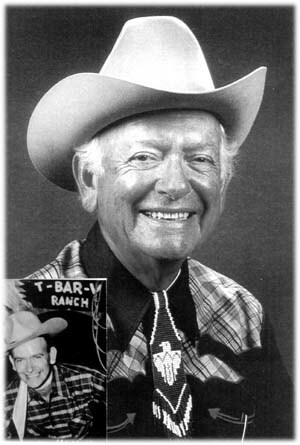 During his long tenure at WHAS, he became synonymous with a show that was aired when the WHAS-TV first went on the air in June of 1951, a birthday show called "T-Bar-V Ranch". It originated from the studios of WHAS every Friday night and was one of the highest rated of Louisville-originated shows then. 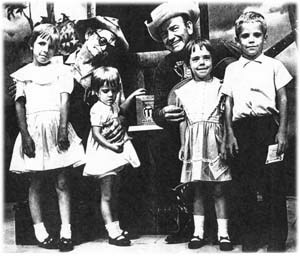 This half-hour show was on at 4:00pm, Monday through Friday and much as other entertainers have found over the years, Randy found a lot of joy in working with the little kids on the show because of the "...free way they express themselves". 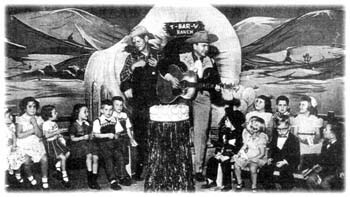 Kids all across Kentuckiana knew they were in for a good time when Randy and his sidekick, Cactus (Tom Brooks) would start off the T-Bar-V Ranch birthday party show with "One Little, Two Little, Three Little Cowboys...". The show would have country songs, interviews with the kids that you know would just be full of surprises as well as a birthday cake and the comedy of Cactus. The show also helped out mom and dad at home, too, for it seems Randy and Cactus would inject little health and safety reminders into the dialogs of those daily shows. As testament to the sway they held over the kids, it was reported that scores of parents would call Randy and Cactus and implore them to tell the youngster at home that they needed to drink their milk and eat right to grow up to be big like them. A promotional item for the show indicates that in November 1953, the White Castle Systems chose the T-Bar-V show to pitch its hamburgers three days a week. A year later, ad spots opened up for the other two days and White Castle quickly snatched up the time over a full 52-week schedule. The Greater Louisville First Federal Savings and Loan Association also saw the benefits of their show - they started sponsoring the show on December 11, 1950 and in three years, reportedly 15,000 children had opened accounts from that advertising. In a testament to the kids, the release mentions that the 'salesmen' for T-Bar-V were the 25 or so birthday-celebrating kids that were a part of the show each day. They were the shows best salespersons as they would tell everyone when they got back home of the grand experience they had on the show. Randy was the star of the show and did most of the commercials, but his beloved sidekick, "Cactus" Tom Brooks was noted as "...the world's worst cook and the victim of every prank on T-Bar-V." He had played the role for many years - as the "...off-key singin', miniature guitar-pickin' refugee from the Chuck Wagon." In short, the kids loved him. The show ended without fanfare one Friday in 1970 - when the station manager told him simply, 'That's you're last show.' And on the following Monday noted an May 2001 article, the station began airing reruns of syndicated shows such as My Favorite Martian which were apparently more profitable to carry than a local, live show. Sadly, not one tape of the show was ever made. But Randy notes, the people still remember it fondly. 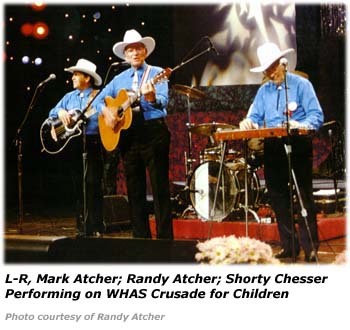 And they held a reunion show of sorts in May 2001, with the net proceeds from the dinner going to the WHAS Crusade for Children, for which Randy had been a part of for many years as well as hosting the local segments at times for the Jerry Lewis Telethons. A press release from WHAS from August 1953 announced that Randy Atcher and the Old Kentucky Barn Dance would be a part of the CBS network Saturday night broadcast lineup on a show called "Saturday Night - Country Style" every third week. The CBS show would rotate among various live barn dance / jamboree type shows and we often see audition tapes and transcripts for this show. The press release mentions that Randy sang, "hillbilly, western and folk songs" and was a "fine yodeler". 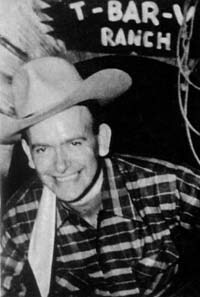 In 1953, he had two daily quarter-hour shows on WHAS and hosted the Saturday night Barn Dance broadcasts. In reviewing a page of a WHAS Radio News piece promoting WHAS events at the Kentucky State Fair in 1959, it seems Randy was quite a one-man gang at WHAS in those days. And a write-up on his twice a day show mentions he was booked for personal appearances 12 months in advance. At 12:15pm each day, he hosted a show called "Randy Sings Ballads". Then at 1:00pm, Randy and the Red River Ramblers did an hour show. On Saturdays, he did the "Country Record Shop" show from 7:30pm to 8:30pm, which also had his son, Ranny, working with him on the show. In fact, his son, a teen-ager then, was good at helping his dad find some of the new hit tunes of the day and also exposed his dad to some of the younger crowds liking of rock music. But he noted in an undated TV Guide interview that his son was playing the guitar already and noted, "He plays much better than I did at that age." And then there was the WHAS Old Kentucky Barn Dance that was on Saturdays then from 6:00pm to 7:00pm. And the popularity of the barn dance show was such that it was featured on two Saturday nights at the Kentucky State Fair in 1959 - September 12 and 19. The WHAS Radio News piece mentions that the show would on occasion be held in other locations and had more than 100,000 people attend the show in a single year as it appeared "...throughout Kentucky and southern Indiana." They mention that the show even appeared at the Indiana State Fair. An undated TV Press article notes that many people talked of the 18,500 people who attended the Hayloft Hoedown at the Jefferson County Armory one February as well as another 13,000 who saw the show at one Kentucky State Fair. But there was a memorable show that 5,000 saw in the summer of 1951 when the show was at the Kentucky State Fair. The article relates one of the humorous moments in the long run of the show and of course, Randy was at the center of it. It was the height of opening Friday night at the Kentucky State Fair the Square Dance contest had gotten down to the final four teams and the winning team would be chosen during the "Hoedown" program, which had been increased to an hour that night. The show opened just as it usually did - the dancing, the playing of the sponsor's theme, with the cast singing the closing line, "Goin' to the Hoedown in a Brand New Ford..." And then announcer Ed Mills would step up to the microphone and with the enthusiasm an emcee could stir up, and announce, "And now here's your cowboy star of the Hayloft Hoedown, Randy Atcher!". As you might expect, the crowd rose in unison to give Randy a thunderous standing ovation. The cameras on stage and on a raised platform were zeroed in on Randy. The script called for him to ride a 'borrowed' horse, rear it back, hop off and then just go right up to the microphone and commence singing the opening song. But the horse had other things on its mind. It reared up, then refused to go towards the stage. Randy struggled for a few moments to stay on the bucking horse, but finally had to slide off. Then ran the last 60 yards to the stage and just about out of breath, started singing the opening song that night, "I Wanna Ride, Ride, Ride (Down the Trail to San Antone)". Randy had tried before the show to get the horse used to the crowd noise, riding him back and forth in the noisy atmosphere. And he had succeeded in calming the horse. But before the show started, a producer thought that Randy and the horse were 'too dark' and ordered that a big 1,000 watt spotlight be shone on them. And it probably spooked the horse like a bolt of lightning and at the same time, the loud ovation from the crowd starting off, too. Needless to say, they reported he brought his own horse the next week. And in one last jab, the article mentions that when the Hoedown show was to go to the Armory on December 12 (1952) for the debut of the 1953 Ford, they noted, "...you can bet Randy will leave the horse at home." A TV Guide interview with Randy notes that Randy and the Red River Ramblers were the stars of a TV show over WHAS called "Hayloft Hoedown" at the time and had been on the air nearly seven years. Its format had changed little over the years, and the Hayloft Hoedowners were added later and he noted in the interview, "The pretty young singers are the ones we have a hard time holding." Randy Atcher and his Red River Ramblers (seemingly the inspiration for the name of his band comes from the days of his growing up in the Red River valley area of North Dakota) were the mainstays of the WHAS Old Kentucky Barn Dance. The Red River Ramblers were quite a group of talented entertainers. George Workman was the bass and banjo player for the group and had been with WHAS since 1946. 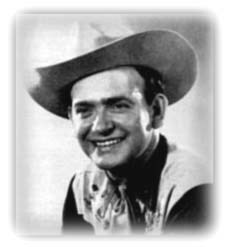 But his first appearance on H-A-S, as they called it back then, was in 1937 with Sunshine Sue and the Rock Creek Rangers. Shorty Chesser, was called the "self-appointed honorary Mayor of Pleasure Ridge Park, Kentucky." He was known for the novelty numbers he did as well as his guitar playing. He became a part of Randy Atcher's group in 1949. Bernie Smith started on WHAS in 1937 and played both the guitar and banjo. He played with the Burl Ives band in 1946, but returned to Louisville. 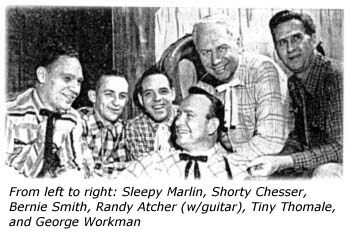 Sleepy Marlin was an international fiddle champion and had been a star over WHAS since 1951 and was said to have won "...just about every major fiddling contest conducted." Also mentioned were Bobby Lewis and Judy Marshall who had started at WHAS in their teens and had first appeared on the "Hi Varieties" show. The Hayloft Hoedown would last another decade before finally presenting its last show at 7:00pm on Saturday night January 2, 1971. 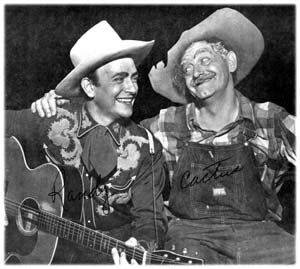 The show was a victim of its own success as well as the popularity of country music at that time. The trend on television at the time was toward "big budget, slickly produced, expensive show with scads of big names." And it became apparent that local shows such as this couldn't compete with the likes of the Glen Campbell show or the Johnny Cash show. Seemingly the managers at the station felt that while they enjoyed the relationship with Randy Atcher and the Red River Ramblers, they felt a single station couldn't provide the type of country show the "...public demands." The Hayloft Hoedown show wasn't the only local show facing the axe at that time as WHAS also dropped its local Wednesday night movie and began carrying the CBS shows, Medical Center and Hawaii Five-O. The Hayloft Hoedown was first replaced in its 7:00pm Saturday night slot by the "Truth or Consequences" game show. Around the same time, Randy had auditioned with Tina Lou Wallace of the American Printing House for the Blind in Louisville, was accepted and had read for them since that time. In 1994, he scored an award, the "Oscar" for reading, awarded by the American Foundation for the Blind, the "Alexander Scourby" Award for nonfiction. Randy is a Kentucky Colonel and has the distinction of being the only performer (at that time - 1959) to have dedicated a room at Ft. Knox, the "Western Music Room" and had a life-sized photograph of him on display. A newspaper article in May 2001 notes that his wife Daphne died in 1977. Two years later, he married Elizabeth Thorne Blankenbaker, whose late husband was a puppeteer on the old T-Bar-V Ranch show. * NOTE: We gratefully acknowledge and thank Mr. Randy Atcher for providing us with copies of the articles denoted by the asterisk as well as several of the photos.